Think about it. We want to know how the child experiences his or her illness and therapies, and we can just ask, right? Well, some children are too young to even understand or respond to questions, infants and young toddlers, others go through a “no” stage and answer “no” to every question, and others may be unable to respond to questions for a range of other reasons. The recent IOM workshop, Comprehensive Cancer Care for Children and their Families, touched on some key issues around use of PROs in children with cancer, and much of what was said is applicable to children with other diseases and conditions. I’m hoping that video of the presentations will be posted (they often are). We discourage proxy-reported outcome measures for this population (i.e., reports by someone who is not the patient responding as if that person were the patient). For patients who cannot respond for themselves (e.g., infant patients), we encourage observer reports that include only those events or behaviors that can be observed. Bryce Reeve made a critical point in favor of use of PRO’s in pediatric cancers. He presented evidence that there is a low correlation between clinicians’ report and patient report for a range of symptoms. The consequence of relying on clinicians’ report for identifying adverse events is an underestimate of adverse events, something that can be corrected by broader use of PRO’s in cancer research. Presumably this is relevant to other diseases, as well. When children are in the hospital, they often need pain relief or sedation, yet most drugs used for pain relief or sedation in children have not been studied in children. A first step in understanding the overall use of pain medications is to document the medications used and their frequency of use. Our publication, “Use of Analgesic, Anesthetic, and Sedative Medications During Pediatric Hospitalizations in the United States 2008”, published in the journal, Anesthesia and Analgesia in 2012, describes medications used in over 800,000 hospitalizations. 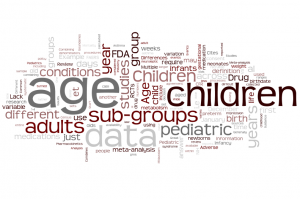 We describe use of analgesics, anesthetics, and sedatives in pediatric inpatients by conducting a statistical analysis of medication data from the Premier database. We identified all uses of a given medication, selected the first use for each child, and calculated the prevalence of use of specific medications among hospitalized children in 2008 as the number of hospitalizations in which the drug was used per 100 hospitalizations. Dose and number of doses were not considered in these analyses. The dataset contained records for 877,201 hospitalizations of children younger than 18 years of age at the time of admission. Thirty-three medications and an additional 11 combinations were administered in this population, including nonsteroidal antiinflammatory drugs, local and regional anesthetics, opioids, benzodiazepines, sedative-hypnotics, barbiturates, and others. The 10 most frequently administered analgesic, anesthetic, or sedative medications used in this population were acetaminophen (14.7%), lidocaine (11.0%), fentanyl (6.6%), ibuprofen (6.3%), morphine (6.2%), midazolam (4.5%), propofol (4.1%), lidocaine/ prilocaine (2.5%), hydrocodone/acetaminophen (2.1%), and acetaminophen/codeine (2.0%). Use changed with age, and the direction of change (increases and decreases) and the type of change (linear, u-shaped, or other) appeared to be specific to each drug. 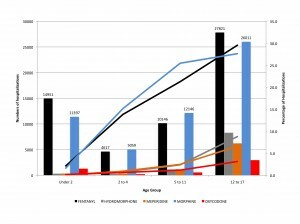 Figure 1 shows the number and percentage of pediatric hospitalizations with nonsteroidal antiinflammatory drug (NSAID) use, by age group. Bars indicate number of hospitalizations. 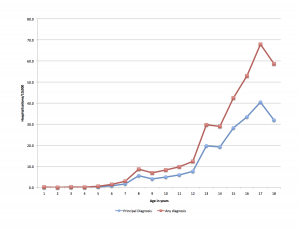 Lines indicate percentage of hospitalizations. Acetaminophen was considered in these analyses as an NSAID for the sake of categorical simplicity; however, pharmacologically, the antiinflammatory activity of acetaminophen is minimal, such that some do not consider it a true NSAID. Figure 1. Number and percentage of pediatric hospitalizations with non steroidal anti-inflammatory drug (NSAID) use, by age group. 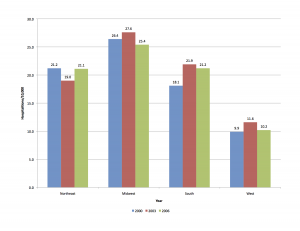 Figure 2 shows the number and percentage of pediatric hospitalizations with opioid use, by age group. Bars indicate number of hospitalizations. Lines indicate percentage of hospitalizations. Figure 2. Number and percentage of pediatric hospitalizations with opioid use, by age group. Chronic pain in children is seriously underrecognized in comparison with the prevalence of chronic pain in adults. This is one more circumstance in which labeling in children would be very beneficial to anesthesiologists and their patients. Children get hospitalized for depression and bipolar disorders. I wasn’t aware of how frequently this happens until I got my hands on some BIG DATA – the HCUP KID database of children’s hospitalizations. My colleagues and I analyzed hospitalizations in 2000, 2003 and 2006 and published our results in the journal, Child and Adolescent Psychiatry and Mental Health in 2011. For each of these years, we were able to look at records for over 2 million hospitalizations, and able to project these to the entire number of pediatric hospitalizations in the US in those years. 12.1-13.0 out of every 10,000 children were hospitalized with mood disorders as the principal diagnosis in 2000-2006. The incidence of hospitalizations for children with mood disorders increased with age – this figure uses data from 2006 to show the trend. A surprising finding was the big differences between regions of the country. As an example, in 2006, the Western region experienced the lowest rates (10.2/10,000) while the Midwest had the highest rates (25.4/10,000). This figure shows the rates for 2000, 2003 and 2006. Mood disorders including depression and bipolar disorders are a major cause of morbidity in childhood and adolescence, and hospitalizations for mood disorders are the leading diagnosis for all hospitalizations in general hospitals for children age 13 to 17. Between 2000 and 2006, inflation-adjusted hospital charges increased from $10,600 to $16,300. As with so many medications used widely to treat children, morphine is not labeled for pediatric use. Describing patterns of use helps us understand how many children are receiving a drug that is not approved for pediatric use by the FDA. A statistical analysis of 877,201 pediatric hospitalizations in the United States in 2008 estimated that morphine was used in 54,613 (6.2%) hospitalizations in the database. If this percentage is applied to the total number of children’s hospitalizations in the US in 2008, as many as 476,205 children will have received morphine during their hospital stay that year. Fractures and appendicitis were two of the diagnoses most frequently listed for children receiving morphine. 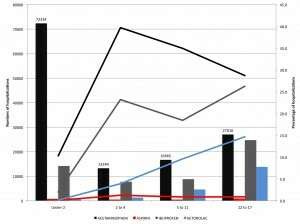 The article reporting statistical analysis on morphine use in pediatric inpatients can be found here:”Morphine Use in Hospitalized Children in the United States: A Descriptive Analysis of Data From Pediatric Hospitalizations in 2008″Lasky T, Greenspan J, Ernst FR, and Gonzalez L Clinical Therapeutics 2012, 34(3): pp.720-727. The American Academy of Pediatrics discussion on “Uses of drugs not described in the package insert (off-label uses)” can be found here. Pediatrics. 2002;110: 181–183.